Acute pulmonary embolism (PE) is a common clinical disease with very high mortality (52%) in patients who are hemodynamically unstable ,. Prompt diagnosis and appropriate therapy for unstable patients may reduce the mortality of massive PE ,. A computed tomography pulmonary angiogram (CTPA) and bedside transthoracic echocardiogram (TTE) are often performed to confirm the diagnosis of PE. Classic electrocardiogram (ECG) changes in patients with acute PE include the S1Q3T3 pattern, T wave inversion (TWI) or ST deviation in the precordial or inferior leads  and right bundle branch block (RBBB), as a marker for a main pulmonary trunk embolus . Recently, Zhong-Qun et al. reported a new ECG pattern that was observed in three patients with acute PE during hemodynamic instability. The characteristic ECG changes of acute PE after clinical deterioration are ST elevation (STE) in lead aVR with concomitant ST depression (STD) in leads I and V4–V6. This ECG pattern in favor of unstable PE may help clinicians in the rapid identification of high risk patients who can benefit from early thrombolytic therapy, surgical thrombectomy or catheter-directed removal and/or lysis of the thrombus. Thrombolytic therapy is very useful in treating an acute massive PE that causes hemodynamic instability . However, its efficacy can be reduced by cardiac arrest which further promotes thrombosis and restricts access of thrombolytic agents. When hemodynamic collapse complicates an acute massive PE in a patient under thrombolytic therapy, immediate cardiopulmonary resuscitation (CPR) may improve the efficacy of the thrombolytic agent. Because the right ventricle (RV) is primarily a volume pump, it cannot respond effectively to acute, large occlusion of the pulmonary arteries (PAs). Vigorous manual chest compression may support the circulation during the initial critical state when the thrombolytic agent has been administered but has not yet taken effect. Recently, Nobre et al . reported that 4 of 6 patients with in-hospital cardiac arrest during thrombolytic therapy for acute massive PE survived after CPR with prolonged manual chest compressions. It was emphasized that vigorous chest compression could improve systemic perfusion, counteract the prothrombotic state associated with cardiac arrest, and give the thrombolytic agent time to act. In this paper, we reported a patient with acute hemodynamically unstable PE who presented with characteristic ECG findings, developed pulseless electivity activity (PEA) during systemic thrombolytic therapy with recombinant tissue plasminogen activator (r-tPA), survived after immediate CPR with 6 min of manual chest compression, recovered well, and finally showed resolution of these ECG changes, suggesting recovery of RV dysfunction, on follow-up after discharge from the hospital. A 65-year-old man who had a history of hypertension, smoking and drinking alcohol, complained of a sudden onset of dyspnea, chest pain, dizziness, cold sweating, watery diarrhea, and general weakness after playing mahjong for 4 h in the morning. He immediately called for help on his mobile phone and was sent to a local hospital, where his blood pressure (BP) was only 82/41 mmHg. Acute coronary syndrome was first considered, so aspirin 300 mg and clopidogrel 300 mg were prescribed. He was transferred to our emergency department, where his BP was 103/80 mmHg, pulse rate 102/min and respiratory rate 24/min. There were no physical signs of deep vein thrombosis in his legs. His ECG showed sinus tachycardia, left atrial enlargement, an S wave in lead I, a Q wave in lead III, incomplete RBBB, TWI in leads V1–V3, STE in leads aVR and V1, and STD in leads I, II, III, aVF, and V4–V6, [Figure 1]a. Bedside TTE disclosed dilatation of the RV and right atrium. A chest radiograph showed no widening of the aorta or pulmonary edema. Based on the symptoms, ECG, chest radiography and bedside TTE findings, acute massive PE was highly suspected. CTPA confirmed massive emboli in the left and right PAs [Figure 2]a and showed the RV/left ventricle (LV) diameter ratio was abnormally increased to 1.22 [Figure 2]b. Within 40 min after arrival in our ED and initiation of intravenous (IV) heparin, his BP dropped to 61/40 mmHg and he lost consciousness. He received emergency endotracheal tube intubation for respiratory failure and a dopamine infusion titrated to 7–26 μg/kg/min to keep his BP around 100/70 mmHg. He was then admitted to our intensive care unit and given r-tPA 10 mg by IV bolus, followed by a 50 mg IV drip over 30 min and a 40 mg IV drip over 90 min. During the thrombolytic therapy, cardiac arrest with PEA occurred and CPR was performed immediately. Successful return of spontaneous circulation (ROSC) was achieved after manual chest compression for 6 min. The laboratory data showed his serum troponin I was 0.61 μg/L, D-dimer 4956 ng/mL, creatinine 2.0 mg/dL, glucose 213 mg/dL, aspartate aminotransferase 350 IU/ml, alanine aminotransferase 78 IU/ml, lactic dehydrogenase 313 IU/L, and lactate 4.6 mmol/L. Heparin was continued and overlapped with oral warfarin starting on the 6th hospital day, when the vasopressor and ventilator were successfully weaned. Heparin was then discontinued when the prothrombin time international normalized ratio reached 2.5. He recovered and was discharged from the hospital on warfarin 5 mg and valsartan 80 mg daily. A subsequent ECG in our outpatient department (OPD) showed resolution of TWI in leads V1–V3 and incomplete RBBB [Figure 1]b. A lung scan and echocardiogram at 32 days revealed mild heterogenous distribution of radioactivity in the bilateral lung fields and normal RV chamber size (2.1 cm) with fair RV systolic function based on tricuspid annular plane systolic excursion (2.5 cm) and RV fractional area change (45%). The estimated systolic pulmonary arterial pressure (SPAP) was 37 mmHg. There were no further complications such as chronic thromboembolic pulmonary hypertension, after 18 months follow-up in the OPD with oral warfarin therapy. Our patient had only weak risk factors for venous thromboembolism, including immobilization due to prolonged sitting, hypertension, increased age and smoking , and no physical signs of deep vein thrombosis. Acute massive PE was suspected by bedside TTE showing a dilated RV and further confirmed by CTPA with large thrombi in the bilateral PAs. His ECG displayed characteristic changes suggesting hemodynamic instability and a high risk of mortality. In acute PE, the ECG is often abnormal and findings are neither specific nor sensitive, limiting its diagnostic value . However, these ECG changes can help stratify risk and determine prognosis once the diagnosis is made. In 2001, Daniel et al . created a 21-point ECG scoring system whereby points are assigned for the following changes (number of points in parentheses): sinus tachycardia (2), incomplete RBBB (2), complete RBBB (3), TWI in leads V1–V4 (0–12), an S wave in lead I (0), a Q wave in lead III (1), inverted T wave in lead III (1), and entire S1Q3T3 complex (2). With cardiac compensation, the ECG score is low if the thrombus occluding the PA is small. Without cardiac compensation, the ECG score is high if the thrombi are large . The scoring system has shown a significant positive correlation with SPAP in acute PE. A high ECG score is a useful marker in predicting RV dysfunction. At a cut-off of 10 points, the ECG score is 98% specific for the recognition of SPAP >50 mmHg. A score less than 4 points can exclude RV dysfunction and resolution of TWI in leads V1–V3 may indicate recovery from RV dysfunction . In recent years, several ECG abnormalities not included in the historical 21-point ECG score have gained attention for prognostic potential in acute PE, including STE in leads III, V1 and aVR and STD in leads I, aVL, and V4–V6. In 2013, Zhong-Qun et al . found that several combinations of ECG findings, including “STE in lead aVR with concomitant STD in leads I and V4–V6” and “STE in leads III and/or V1/V2 with concomitant STD in leads V4–V6,” predicted development of hemodynamic instability. In 2014, Kukla et al . reported that STE in at least one of leads III, aVR and V1–V4 or STD in at least two lateral leads was associated with mortality in acute PE. These ECG changes in acute PE are probably induced by rapid pressure overload, dilatation, and dysfunction of the RV due to occlusion of the PA by massive emboli, resulting in decreased RV outflow and reduced LV preload. Ischemia of the RV, myocardium and conduction system, hypoxemia, and the effects of catecholamines and histamine are also related to the ECG changes . In our case, the ECG showed STE in leads aVR and V1 and STD in leads I, II, III, aVF, and V4–V6, in addition to a 14 point ECG score (sinus tachycardia, incomplete RBBB, a Q in III, TWI in leads V1–V3), indicating high SPAP and RV dysfunction with a great risk of clinical deterioration due to respiratory failure and progressive shock. Thrombolytic therapy with r-tPA 100 mg IV infusion for 2 h is advised for patients with persistent hypotension due to massive PE or recurrent PE despite anticoagulation (Class I, Level B) . Our patient was in shock, so 60 mg r-tPA was given in 30 min followed by 40 mg in 90 min, similar to its use for acute myocardial infarction, with the anticipation that early onset of the thrombolytic effect would save his life. If unstable PE patients have contraindications to or failure of systemic thrombolytic therapy, surgical embolectomy is recommended (Class I, Level C) and catheter-directed reperfusion treatment is an alternative choice (Class IIa, Level C) according to the 2014 guidelines of the European Society of Cardiology . In 2016, Cho et al . in their small retrospective experience reported that surgical embolectomy was associated with lower cardiac mortality than systemic thrombolysis for patients with massive PE without life-limiting comorbidities. Percutaneous catheter-based interventions, if performed in an experienced center, are appropriate for patients with massive PE who have contraindications to systemic full-dose thrombolysis and are unsuitable for surgical embolectomy . Catheter intervention techniques, including conventional and ultrasound-enhanced catheter-directed thrombolysis, thrombus fragmentation with a pigtail or peripheral balloon catheter, rheolytic thrombectomy with an AngioJet ™ catheter, suction embolectomy with a multipurpose catheter, and rotational thrombectomy with an Aspirex ® S catheter, have been used with an 87% clinical success rate in unstable PE ,. In cardiac arrest where massive PE is strongly suspected, there is a consensus that thrombolysis should be considered . In 2015, O'Connor et al . reported that the use of double boluses of r-tPA 50 mg in 20 min for a patient with suspected massive PE during PEA resulted in successful ROSC. Once thrombolysis is initiated for a suspected PE in cardiac arrest, guidelines suggest that CPR should be continued for at least 60–90 min ,. In the report by Nobre et al ., prolonged, vigorous chest compressions were effective for PEA which occurred with massive PE during thrombolytic therapy. Because the RV is proximal to the sternum and even more proximal when dilated, chest compressions may augment the RV output and the circulation of r-tPA to enhance its thrombolytic effect. However, if CPR fails to achieve ROSC quickly in massive PE during PEA, extracorporeal membrane oxygenation (ECMO) support can be applied as a lifesaving adjunct to definitive treatment. In the cohort reviewed by Yusuff et al ., the use of ECMO in critically ill patients with massive PE was associated with an overall survival of 70.1% but those with cardiac arrest had a higher risk of death at a rate around 48.8%. In our case, cardiac arrest with PEA complicated thrombolytic therapy for unstable PE, but successful ROSC was achieved after immediate CPR with 6 min of chest compressions aiding thrombolysis. The resolution of TWI in leads V1–V3 and incomplete RBBB on ECG after hospital leads discharge suggested recovery from RV dysfunction, which was further confirmed by an echocardiogram on follow up in our OPD. We described a patient with acute massive PE demonstrating characteristic ECG changes that might have prognostic value for hemodynamic instability and clinical deterioration. For patients with unstable PE and cardiac arrest with PEA during thrombolytic therapy, immediate CPR with chest compressions could be beneficial for augmentation of thrombolysis and ROSC. The authors certify that the patient have obtained appropriate patient consent form. In the form the patient has given his consent for his images and other clinical information to be reported in the journal. The patient understands that his name and initial will not be published and due efforts will be made to conceal their identity, but anonymity cannot be guaranteed. Stein PD, Matta F. Thrombolytic therapy in unstable patients with acute pulmonary embolism: Saves lives but underused. Am J Med 2012;125:465-70. Yeh KH, Chang HC. Massive pulmonary embolism with anterolateral ST-segment elevation: Electrocardiogram limitations and the role of echocardiogram. Am J Emerg Med 2008;26:632.e1-3. Petrov DB. Appearance of right bundle branch block in electrocardiograms of patients with pulmonary embolism as a marker for obstruction of the main pulmonary trunk. J Electrocardiol 2001;34:185-8. Zhong-Qun Z, Chong-Quan W, Nikus KC, Sclarovsky S, Chao-Rong H. A new electrocardiogram finding for massive pulmonary embolism: ST elevation in lead aVR with ST depression in leads I and V(4) to V(6). Am J Emerg Med 2013;31:456.e5-8. Nobre C, Thomas B, Santos L, Tavares J. Prolonged chest compressions during cardiopulmonary resuscitation for in-hospital cardiac arrest due to acute pulmonary embolism. Tex Heart Inst J 2015;42:136-8. Digby GC, Kukla P, Zhan ZQ, Pastore CA, Piotrowicz R, Schapachnik E, et al. The value of electrocardiographic abnormalities in the prognosis of pulmonary embolism: A consensus paper. 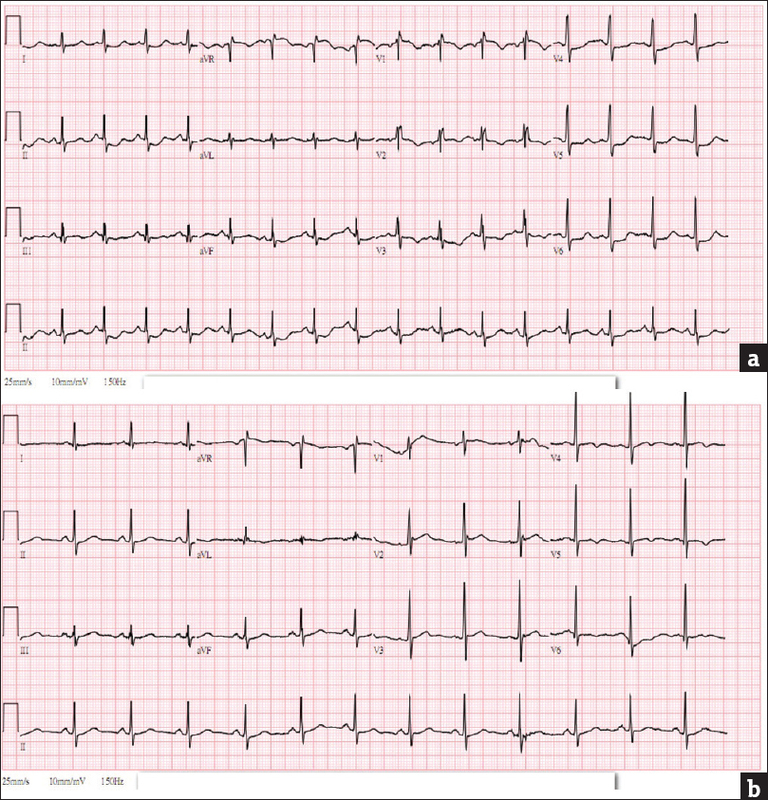 Ann Noninvasive Electrocardiol 2015;20:207-23. Daniel KR, Courtney DM, Kline JA. Assessment of cardiac stress from massive pulmonary embolism with 12-lead ECG. Chest 2001;120:474-81. Choi BY, Park DG. Normalization of negative T-wave on electrocardiography and right ventricular dysfunction in patients with an acute pulmonary embolism. Korean J Intern Med 2012;27:53-9. Kukla P, McIntyre WF, Fijorek K, Krupa E, Mirek-Bryniarska E, Jastrzebski M, et al. Use of ischemic ECG patterns for risk stratification in intermediate-risk patients with acute PE. Am J Emerg Med 2014;32:1248-52. Smulders YM. Pathophysiology and treatment of haemodynamic instability in acute pulmonary embolism: The pivotal role of pulmonary vasoconstriction. Cardiovasc Res 2000;48:23-33. Cho YH, Sung K, Kim WS, Jeong DS, Lee YT, Park PW, et al. Management of acute massive pulmonary embolism: Is surgical embolectomy inferior to thrombolysis? Int J Cardiol 2016;203:579-83. Engelberger RP, Kucher N. Catheter-based reperfusion treatment of pulmonary embolism. Circulation 2011;124:2139-44. Er F, Nia AM, Gassanov N, Caglayan E, Erdmann E, Hoppe UC. Impact of rescue-thrombolysis during cardiopulmonary resuscitation in patients with pulmonary embolism. PLoS One 2009;4:e8323. O'Connor G, Fitzpatrick G, El-Gammal A, Gilligan P. Double bolus thrombolysis for suspected massive pulmonary embolism during cardiac arrest. Case Rep Emerg Med 2015;2015:367295. Hsin T, Chun FW, Tao HL. 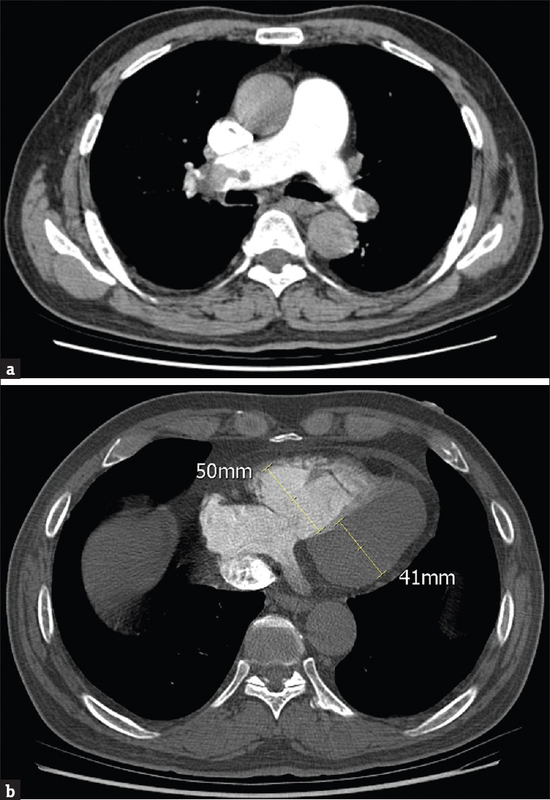 Ultra-long cardiopulmonary resuscitation with thrombolytic therapy for a sudden cardiac arrest patient with pulmonary embolism. Am J Emerg Med 2014;32:1443.e3-4. Yusuff HO, Zochios V, Vuylsteke A. Extracorporeal membrane oxygenation in acute massive pulmonary embolism: A systematic review. Perfusion 2015;30:611-6.